Just in nick of time, the guys give us their professional opinions on navigating the emotional minefield that is March Madness. 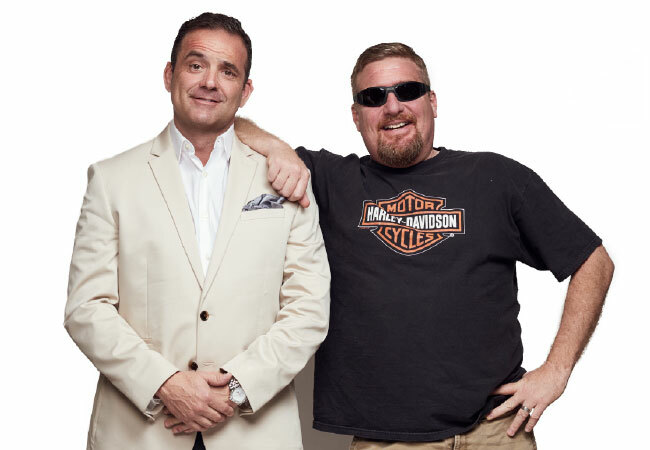 Here, Tony Vanetti and Dwight Witten,co-hosts of Tony & Dwight on 840 WHAS, help you prepare for the insane weeks ahead. What’s the best way to watch the first round, early games: call in sick, schedule a “meeting” outside the office or be honest with your boss? Tony: If you work at a place that doesn’t appreciate March Madness, you need to find a new job. The office must be buzzing with excitement and games on in every room. I used to run a March Madness promotion with a local urologist called vasectomy madness. They would schedule the procedure the day before, bed rest for two days! Overdose on games. Dwight: I have found the best way is to get a vasectomy! It requires four days off from work. I know what you’re gonna say, “What about all the other years?” Simple. You just get it reversed the next year; then snipped the next and so on and so forth. Best local bar to watch a random first round game not involving any of the local teams? Tony: Best local bar depends on what team you cheer for. Make sure you don’t camp out at UK headquarters if you are a Cards fan. TK’s Pub in Fern Creek, any Buffalo Wild Wings, Gerstle’s in St. Matthews. Just pick a place that runs beer specials during games. Dwight: I am not a big bar person but I will tell you my best experience watching non-local tournament games was probably on the waterfront at Splash. Tell ‘em Dwight sent ya! Which Kentucky and Indiana teams will go the farthest in the tournament? Tony: Kentucky has the best chance to go farthest in the tourney. They have the most talent and a Hall of Fame coach. Louisville needs to deliver in the end of conference play to get in. IU still plays basketball? Schadenfreude in March Madness: perfectly understandable or bad karma? Tony: Schadenfreude is not just recommended; it’s part of the enjoyment of the tourney. Early exit by Duke or Kansas! Hell yes! The tourney is now everything. No one cares about the regular season, so if you get bounced early it’s awful. Enjoy others’ misery. Dwight: Perfectly understandable! After a year of both UK and U of L fan bases pulling for each other to do their best with all the love in their heart, it’s hard to imagine them turning on each other. But it actually does happen...very rarely. Office pools: employees only or family and friends? Tony: Office pools are hilarious because it’s always somebody’s 8-year-old niece who wins it all. Don’t get me wrong. It’s a serious thing, but winning is almost impossible these days. Dwight: I never take part in these office bracket pools because it will never pay off! One year, I enlisted two professional basketball analysts, a Vegas odds maker, three former players, a NASA engineer and a tuba player to make my entry a LOCK! Yet the 4-year-old nephew of Tina in accounting won it all by picking pretty colors and funny names. You can hear Tony Vanetti and Dwight Witten on Tony & Dwight, 6-8 p,m, weeknights on 840 WHAS.